Why is the sum of the charges different from the sum of the support forces? What causes could it be? In most cases, these differences can be attributed to a lack of convergence. Increasing the iterations and increments in the calculation parameters and FE mesh settings should help. High stiffness jumps result in numerical problems, which leads to errors in the result evaluation. In RSTAB, this is not a major problem with a full and analytical approach. In RFEM, on the other hand, approximation approaches are used, so higher stiffness jumps should rather be avoided. 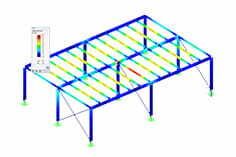 Bedded bars may well be subject to deviations as well. If the bars are not or only roughly divided, there are convergence problems. 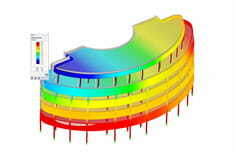 A practical solution here is to select a "finer" bar pitch in the FE mesh settings.